Posted March 29, 2016 by finnfemme & filed under Beauty, Fashion, Vintage. Such a pretty ad from the August 1955 issue of Woman’s Home Companion! I love the gorgeous model in flowers and pastels – so feminine. 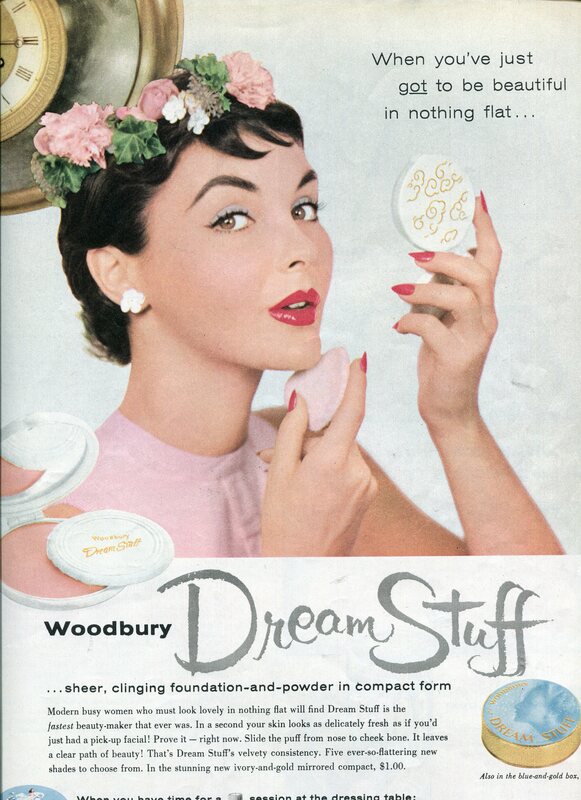 Dream Stuff was a sheer, clinging foundation-and-powder in compact form. It was intended for the busy modern woman who must look lovely in nothing flat. Slide the velvety consistency on the puff from nose to cheekbone. It leaves a clear path of beauty! The stunning new ivory-and-gold mirrored compact cost $1.00. The blue-and-gold box cost 49 cents. I rarely see women use compacts anymore, but they were a really useful and handy beauty tool.